Wooden cutlery feature:Natural wood is selected, no additives, safe and environmentally friendly. The wooden knives and forks are durable, beautiful and exquisite, with a natural atmosphere. Wood is produced from the plants of gymnosperms and angiosperms and is rich in biodiversity. Tree growth is a complex and co-scientific biochemical process that uses light energy to develop itself into a large organism using carbon dioxide, water and minerals. Wood is the main product of vegetative growth of trees. The formation of wood is a process of absorbing carbon dioxide, carbon sequestration and releasing oxygen, which is conducive to improving the ecological environment. How to make the wooden cutlery? 1. Choose wood from places with abundant wood resources (not used for trees that are too young; cut down a tree and replant three to five small saplings), and use more robust trees. 2. Return the wood and cut it into small pieces for storage. 3. After the storage for a period of time, the wood is treated, peeled and flattened. 4. 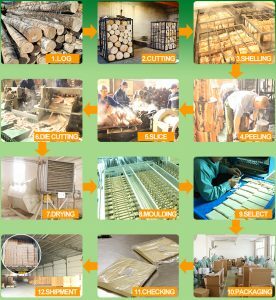 Automatically produce the processed wood into the machine. 5. Take out the finished product one by one and remove the defective products. The quality product is subjected to a manual grinding to avoid the surface of the product not being smooth enough. 6. Pack, store and ship the polished products. Our cutlery manufacturers are able to customize high-quality cutlery and other products(such as bowls, plates, cookware, tableware…), if you are interested, please contact us.